How to trade stock breakout is quite a common question I receive several times a year. Breakout stock trading strategies are a good type of market strategy for online securities trading. Breakout trades could make very good profits if they are done and managed well. A breakout strategy is a good option, especially for traders that want to trade stocks from home. Swing trades and position trades need not so many trade management steps to make good profits. The trading plan for a breakout strategy is based on several simple steps. They are simple but must be done well to achieve desired results and make profits from a trade. 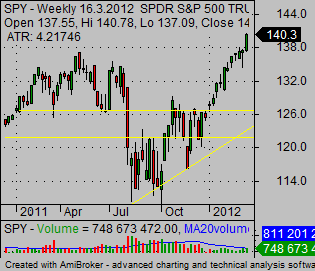 Check that general market trend is bullish. A breakout strategy produces very good trading results only in a bullish market situation. It is not a good trading strategy in a bear market where most breakout trades fail. 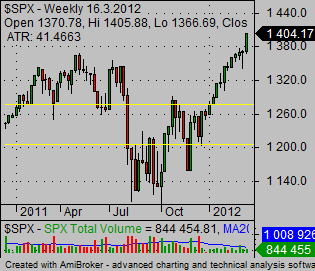 Therefore, the first key point is to confirm that charts of the stock market indexes are bullish. The major US indexes are Nasdaq 100 Index and S&P500 Index. I personally monitor these two indexes for my market mood analysis. Any trader who trades mostly on US exchanges should check these major indexes. There is also one alternative that uses index exchange traded funds for technical market analysis. There are index ETF securities with symbol SPY and QQQ. SPY represents the S&P 500 Index and QQQ represents the Nasdaq 100 Index. You can analyze them instead of indexes. There are different ways to define a bullish market situation. I recommend to use simple technical stock indicators like moving averages and candlestick charts to analyze today’s situation. When you find that the actual situation with major US indexes is bullish, you can think about using breakout strategies. Do not try to trade bullish breakout trades in a bearish market situation. These trades will fail most of the time and it will hurt the profitability of your trading system a lot. There are several points that must be fulfilled for any good setup for a breakout trade. The basics of knowing how to trade stock breakout start with a selection process that looks for candidates for such bullish breakout trade. This process can be easier using some good market screener that helps to filter the most suitable candidates for this type of online trade. But before you can scan for your trading opportunities you have to know what is a typical stock chart of a good trading opportunity. The best candidates should have charts like these examples. 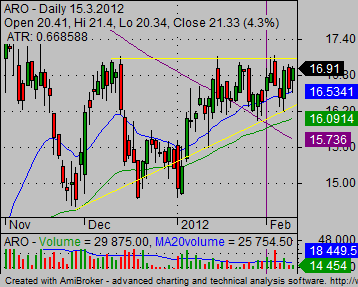 As you can see these charts look typically like a ascending triangles chart pattern or a cup and handle chart pattern. 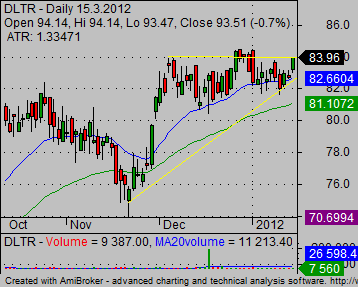 Now you can use a screener to select stocks that have a similar technical chart as is shown above. Stocks that have one of two best bullish chart patterns for breakouts – ascending triangles or cup and handle. Such a screener produces a list of good candidates for a breakout trade. But you have to do more and find excellent candidates for a breakout trade. You have to go through the list of screener results and check charts one by one. And select only the best opportunities. The best candidates should have charts like these examples.